Ryzen processors have been a major hit among AMD fans, but in order to combat Intel's years of dominance, everyone's favourite underdog needs to work closely with system integrators and OEMs to ensure Ryzen is showcased to its full potential. This historically has proven to be AMD's Achilles' heel and the first batch of Ryzen-based PCs struggled to hit all the right notes as manufacturers adapted to the new hardware. A number of SIs opted not to send in 1st Gen Ryzen systems for review, often citing BIOS or driver bugs, limited memory compatibility and poor overclocking performance when compared to Intel equivalents. Conspiracy theorists will no doubt be up in arms, but AMD is aware of Ryzen's somewhat rocky road to retail and has been hard at work ironing out the kinks over the course of the past 12 months. The culmination of that work is 2nd Gen Ryzen, launched today as a more mature choice for consumers and system integrators alike. Our in-depth review of the new chips reveals 2nd Gen Ryzen to be a solution that just works. High-speed memory right off the bat? Check. Mature BIOS implementation? Check. Protection against Spectre and Meltdown? Check. This is Ryzen done right, and the platform's dependability is reflected by the fact that system integrators are now eager to seed review systems that highlight AMD's more-cores-for-your-money approach. Cyberpower isn't wasting any time and has sent HEXUS a day-one base unit for evaluation. Dubbed the Ultra 7 GTX, this £1,369 machine is one of the most affordable towers we've tested in recent years and yet offers an eight-core, 16-thread CPU as well as dedicated GeForce GTX 1070 graphics. A potent combination, however Ryzen's value outlook is such that base units outfitted with even the top-of-the-line Ryzen 7 2700X aren't likely to be brimming with visual wow factor. We know that Cyberpower can create eye-catching builds, but Ryzen tends to be about keeping costs down, and Ultra 7 GTX's appearance reflects its modest price tag. We wouldn't go as far as to call it bland - the Cooler Master MasterBox MB500 chassis has RGB fans and a glass side panel - but we wonder if a non-windowed sound-dampened enclosure would be a better fit for this particular build. 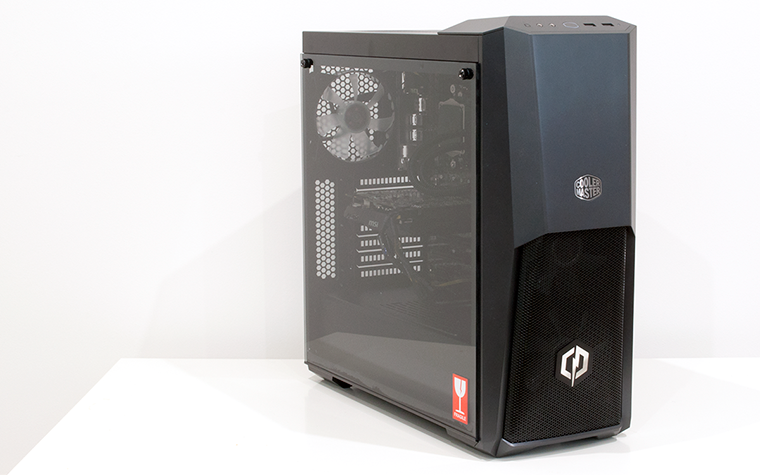 Then again, if you're concerned about the way your PC looks, you'll be pleased to hear that Cyberpower's exhaustive configuration options include a wide range of chassis, case fans and coolers. You can quite easily make the Ultra 7 GTX appear way more impressive by upping the budget, but the default spec is all about the core components. At the helm is a stock-clocked, eight-core AMD Ryzen 7 2700X processor sat atop an Asus Prime B350-Plus motherboard. It is interesting to see Cyberpower opt for an entry-level AMD chipset by default, though those who require SLI support or, say, USB Type-C, have a choice of X370 or X470 upgrades. Some might lament the absence of a factory overclock, but we aren't surprised given that an all-core speed much beyond 4.2GHz can be difficult to maintain on the 2700X chip - such an 'overclock' would be questionable given the chip's default ability to turbo to 4.3GHz on a few cores. Keeping the 105W CPU cool is a Cooler Master Seidon 240V liquid cooler, there's 16GB (2x8GB) of Adata DDR4 memory operating at 3,000MHz without a hitch, and graphics come courtesy of a MSI GeForce GTX 1070 Aero ITX 8GB discrete card. Safe choices all round, and it's good to see Cyberpower not falling into the trap of going all-AMD; there are some decent Radeons available, but few would argue against a GeForce GTX 1070 in this configuration. The keep-it-simple approach extends to all areas. 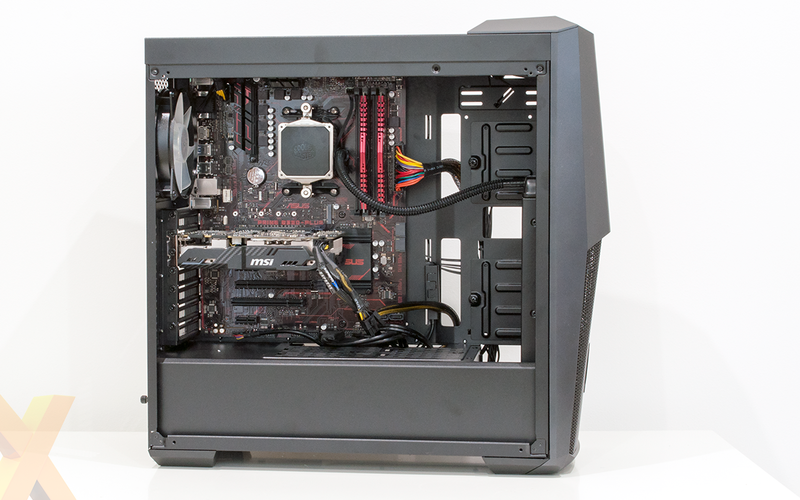 Storage is provided by a 240GB Adata Ultimate SU650 2.5in SATA SSD as well as a 2TB Seagate Barracuda 3.5in HDD, a clean install of Windows 10 is pre-configured with all the latest drivers, while power is sourced from a 500W Cooler Master MasterWatt Lite supply. 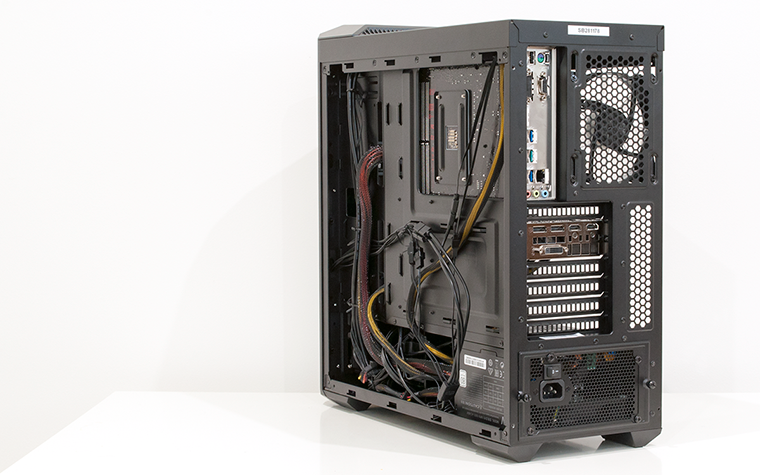 Nothing out of the ordinary, and cable management is passable but hardly fashionable. There's a shortage of flair, though that shouldn't detract from the fact that Ultra 7 GTX offers massive multi-core potential at an agreeable fee. A quick scout around various retailers suggests that experienced users should be able to put together a similar rig for around £1,300, meaning Cyberpower is charging a negligible premium for a turnkey solution backed by a three-year warranty.